Valentine’s Day… thrills and fun or awkwardness and misery? For me, a bit of both. Even as an adult, I am not always in the “right” romantic state to make it giddy bliss. My preference is to downplay specifically “romance” in Middle School. Our most numerous patrons are 5th and 6th graders. Not that 7th and 8th graders won’t come by, but a Teen Read mystery week may be a better draw for them. It’s always a challenge (for me at least) to find the sweet spot to lure in busy 7th and 8th graders. 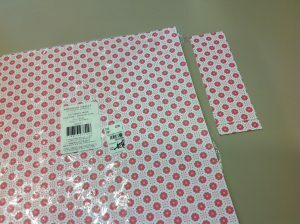 Use 12 x 12 scrapbook paper. 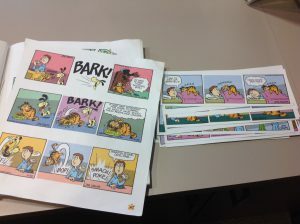 Standard book mark size is 6″ x 2″– a perfect fit. Craft stores (ex: Michael’s; Hobby Lobby) have a wide selection. 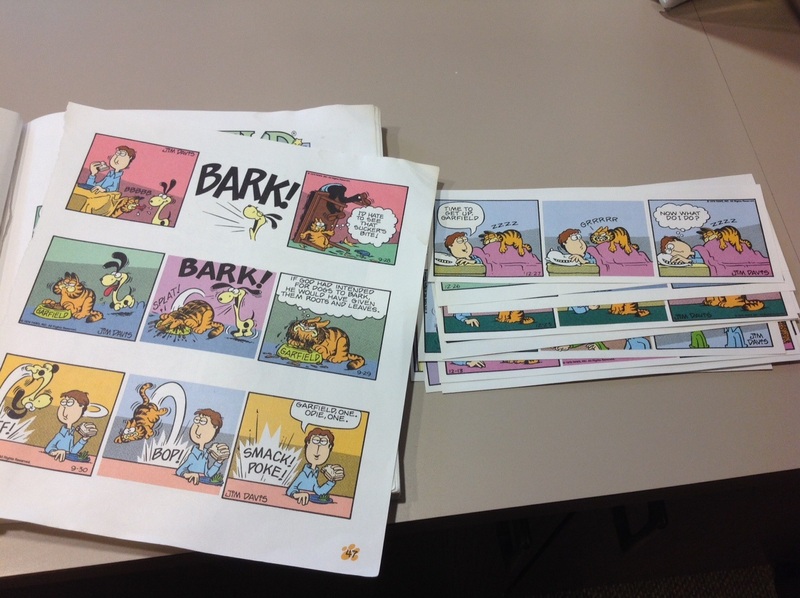 At 15 cents/sheet x 10 sheets = 120 bookmarks for $1.50. Tuesday Morning, Marshalls, TJ Maxx and similar stores are hit or miss, but check the stationery shelves. 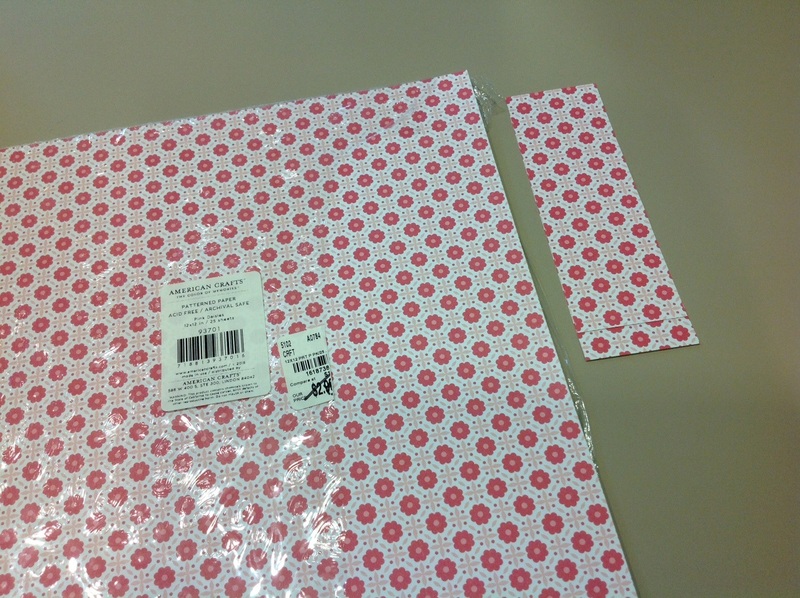 These flowered pages were on sale 25 sheets (300 book marks) for $1.50. Keep your eye out for stickers. Tiny is fine – middle schoolers have great manual dexterity. They can peel one to stick on forehead, hand or cheek. The cuter the better. Hearts or sports balls are also popular. 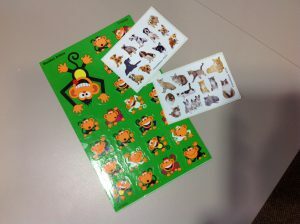 Stickers are often displayed near greeting cards at dollar stores, Walgreens, and many other places. Our local Helzberg Diamonds jewelry store gave me several handfuls of these pins about five years ago, from a big bowl on display. I thought they would be more popular (or perhaps be a flop due to students poking other students) but so far, there is more looking than taking. I checked online, and could not find if they still offered them to educators for free. If you have a Helzberg near you, it might be worth asking. Each pin says “I am loved” in a different language. (I chose a few at random, for the photo.) I put them out on Valentine’s Day. If students ask for one, they can have it. They are a conversation starter that may last a few more years. I’m fine with my low key V-day, and if you have a bolder (or more subtle) way that works for you, please share with a Comment. Old versus New: Or Can a Library Be Both? 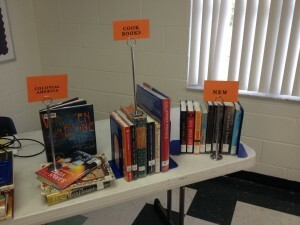 I wasn’t keen on the title of the Feb. 11 Edutopia blog post: Replace “Library” With “Portal of Idea Flow”? But the post made me think. Blogger Grant Lichtman, a self-described “Author, speaker, facilitator, ‘Chief Provocateur’” discusses the role of the library. When ideas were largely contained in printed books, then naturally libraries contained primarily books. For today’s learners, how might libraries facilitate making ideas (and I would add: knowledge) accessible? In “Sweetheart, Get Me Readers,” New York Times Public Editor Margaret Sullivan talks about the pressure to get (and keep) eyes on company websites. No longer is it sufficient for experienced editors and talented professionals to accurately cover news stories. To remain in the game, news organizations must consider amateur videos and tweets from bystanders. She notes the NYT now has an Express Team that covers breaking news, from serious topics to what some might call “fluff” (her word.) The newspaper has found changing with the times is vital to continue to remain relevant. Most librarians I know try to strike a balance. We like a portal of ideas. We have print books. I try to catch of eyes with vibrant Middle School/Upper School Library displays. Currently we are highlighting the YALSA 2014-2019 Outstanding Books for the College Bound. 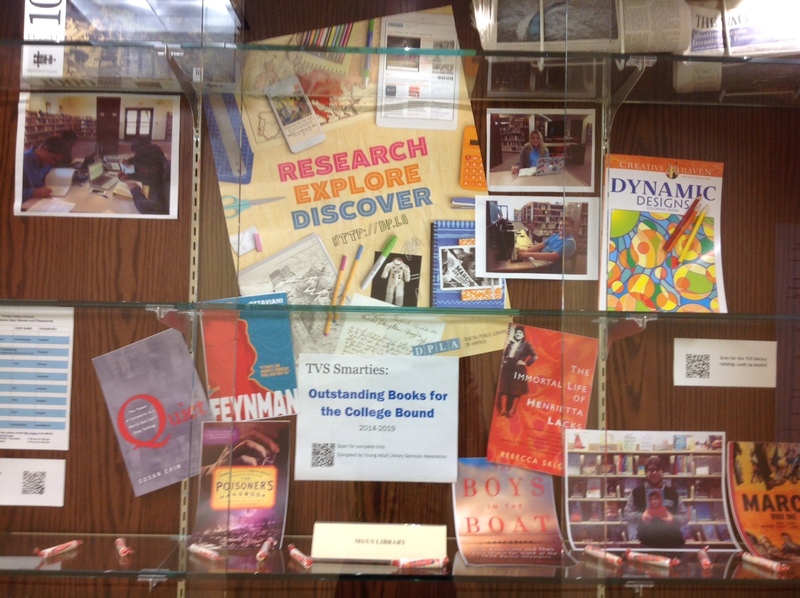 This display case has QR links to the databases and (look carefully) you’ll see jigsaw puzzles, newspapers and adult coloring books. We can’t be everything to everyone, but we try to be a lot of things to a lot of people (while keeping our sanity at the same time!) If you have ideas, let them flow freely with a comment! And yet, the concept that library books are for sharing seems central to me. Building the character trait of responsibility seems important to me: if you borrow something, please return it as agreed, or ask for an extension. And since I promote the idea of browsing when you are in the mood to read, I want popular books frequently in and out, to be browsed. 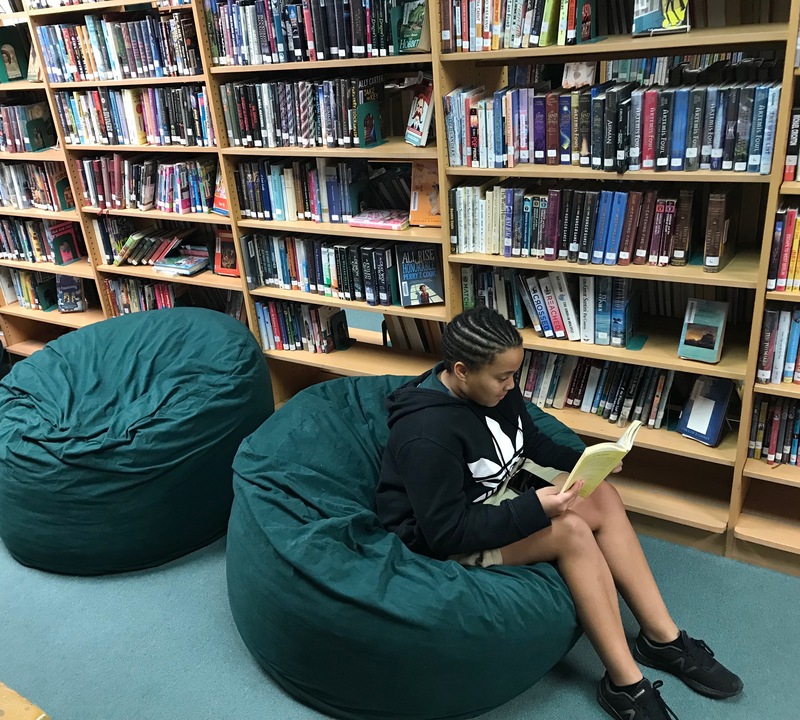 When books are (as Carolyn LaMontagne at the Reed-Gumenick Library at Collegeiate Middle School says) “living in a locker or under a bed” how does that affect other library patrons? To touch on fines: Our policy is 10 cents a day, but students rarely have money on them, and the fines are usually minimal. Usually I will delete the fine with a smile and ask the student to “pay it forward” and do something nice for someone else. That saves me a headache over 80 cents, and still reminds the student of the policy and holds them accountable for the late return. This is a blog post without a “right” answer. Different policies will work for different librarians and different populations. As I expand my notion of what a library is (and it’s expanded it a lot in the past 5 years!) I’m glad that overdue items take up a smaller percentage of my time. Plaase leave a comment and/or share ideas if you have an system that works for you! Not only is it research project season across all grade levels, I’m also working towards some major changes in the library, both physical and philosophical. By August 2015, we expect to have finished construction on a brand-new upper school building that comprises a ground-floor academic commons with café, offices, outdoor pavilion and a writing center; and a second story with a STEM lab and technologically innovative spaces such as a virtual conferencing room. 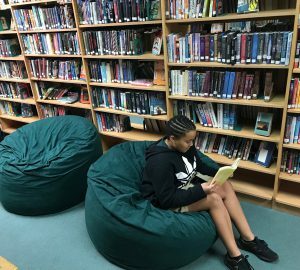 At the same time, we are also retrofitting several of the older buildings to accommodate growing middle school needs, such as a dedicated middle school library space and science area. For me this means engaging in complex and thought-provoking conversations about print versus digital for middle school users, what to do with weeded assets, where to house what parts of the collection, if I anticipate future growth or reduction in particular ranges, and so forth. As well, I am also responsible for some very mundane stuff, such as literally packing weeded books into boxes and driving them to a dropoff point, or putting colored stickers on books to designate their ultimate destination. Every day is a peculiar combination of engaging with students and faculty in classrooms as I give research lessons; having deep philosophical debates with my office mate about the looming digital horizon; and ripping stickers off spines with my fingernails. I’m never bored (but I am constantly confused about how to dress every morning. Am I speaking in front of a roomful of peers and professional superiors, or am I doing the library equivalent of gardening today? Or both?) Did I mention I’m also helping to plan and host the spring AISL conference? Y’all should come, if only to check on me and see how I’m doing. Just like we tell the students, you gotta break the task into manageable pieces and check them off one at a time or else it’s overwhelming and that’s why your paper is late your library doesn’t have any books in it because they’re still in boxes. 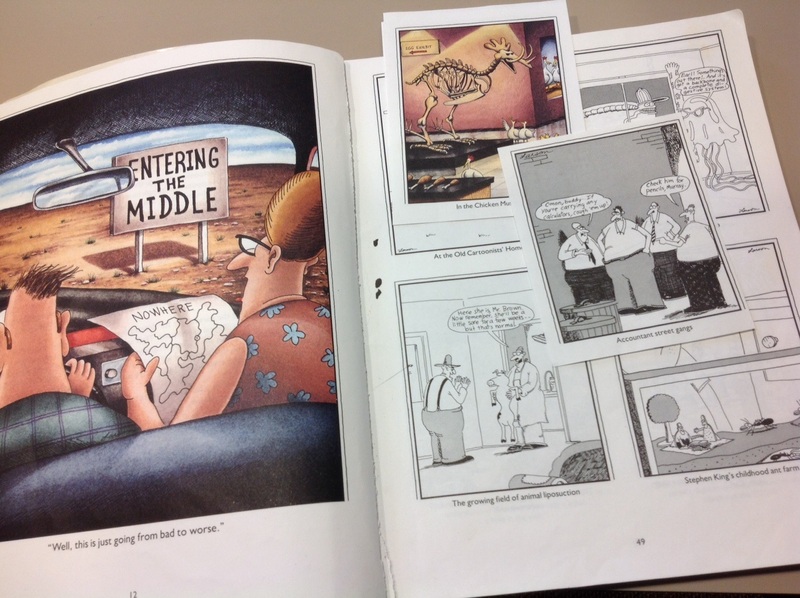 •Tagging books for removal, retention, allocation to the middle school, and “maybe I’ll get rid of this if there’s a digital version but I have to check.” I have several packets of transparent round stickers in red, green, yellow and blue. Red books go, green books stay, blue books go to the future middle school space and yellow ones are in that liminal zone above, so I attack one shelf at a time and sticker as needed. Unscientific, but I’ve been here six years and I know my books and my users. I see the little red and green dots in my sleep now, hence this post’s title. •Meeting with the physical plant manager to discuss space; with the library interior designer to discuss book storage, workflow and furniture choices; with my office mate to delineate who and what will go where after the new space is built. This seems to change daily, so I also devote a few minutes each day to meditating on the illusory nature of permanence. •Packing and delivering weeded books. I know that re-homing discards is a challenge for many of you. I am fortunate in that just this past August, a new independent school opened nearby and they are delighted to receive current books that I have weeded – all I have to do is show up and open my trunk and away they go. Other books will go to Thrift Books or to a recycler to have their paper pulp reclaimed. •Exploring digital equivalents to things I might either weed or retain depending on what I discover. I am tasked with keeping physical growth under control, so I devote such time as I can to looking for alternatives and building a case to present to those who make budget decisions. It’s a heady mix, and among all those things I still have a sixth grade advisory to work with, research lessons to schedule and give, books to shelve, periodicals to manage and all the other daily business to which I am sure you can all relate. I know many of you are on a similar cusp, in that you may also be charged with planning for a new space or conversion to an academic commons rather than a traditional reading-room library. If what I have posted here is of use to you, then please avail yourself of it, and best of luck with your journey! Please comment and share as your own process moves forward. 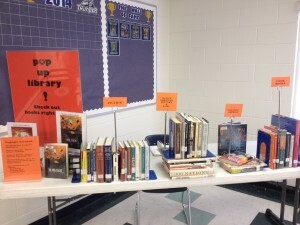 I wrote this post way back in fall of 2013, but since there has been a lot of chatter on the listserv about pop-up libraries as a way to promote new books, I thought I would revisit it. (As well, I should sheepishly admit I am overdue on a blog post and am too mired in some quotidian minutiae to give a new post the attention it deserves, so I am recycling in earnest.) Also, this time of year tends to lend itself to retrospectives, clip shows, and Best-Ofs, so it seems timely. I hope. So, see below for my first Pop-Up Library adventure, and feel free to get in touch about the details of how I made it happen. I continue this program today, at a rate of about one per month. I have been installed here for six years and I recently joked that I had my first “normal” year in 2012: my first year was my first year and I was still finishing my last two credits of library school, my second year I was expecting, my third year I had a new baby, my fourth year we renovated, and finally in my fifth year the dust had settled and things were basically predictable. But suddenly what was to be my second “normal” year in a row took a detour: the administration assigned me to be a sixth grade advisor instead of working with my usual crew of juniors or seniors. There is much greater interaction between advisor and advisees in the middle school, so I was suddenly able to witness the middle school program at very close range. It reinforced what I had long believed to be true: the middle schoolers are my biggest potential consumers of fiction or pleasure reading, but they have the least access to it. In the lower school division, the students have regular, devoted library time each week. 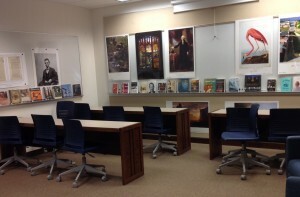 In the high school, students can come in before school, at lunch, during study hall or any free time to peruse the collection and check out materials. In the middle school there is no dedicated library time (yet! That’s another post, I hope) but they are not free to wander into the library by themselves. As well, many of them have confided to me they feel gingerly about entering a library full of “big kids.” What to do? All those glorious young adult titles, desperate to find readers, and an equal number of sad readers bereft of great books. And don’t even get me started on how I feel about the potential future impact on public libraries – isn’t part of our mission to build regular library users into college and beyond? 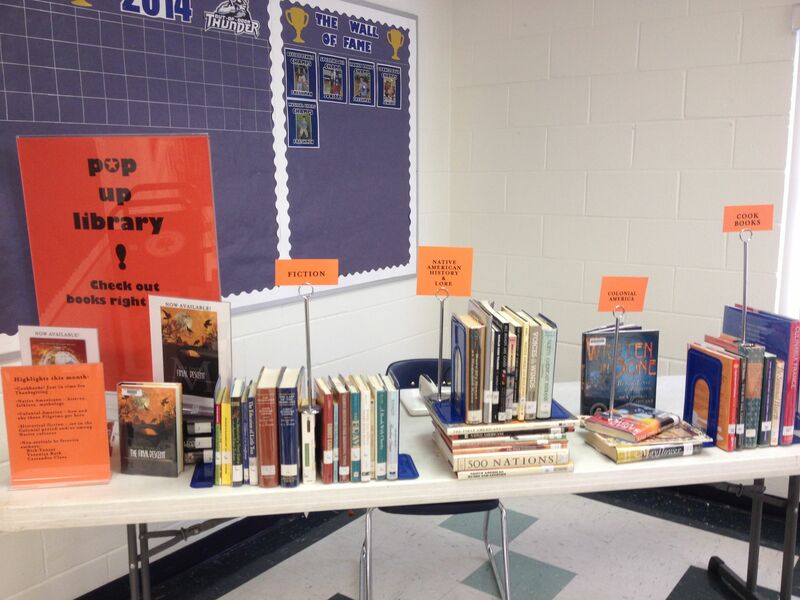 And thus, the Pop-Up Library. If the middle school can’t come to the library, the library can come to them, I thought. I cannot claim sole credit for this particular stroke of genius – it was inspired by a conversation I had with a friend who is a local college librarian. So the library popped up in the cafeteria later that very week: I gathered a selection of very hot current books like the Divergent series, James Patterson’s Maximum Ride books, the Theodore Boone novels, a brand-new copy of House of Hades, and an armful of titles for Halloween. I parked these on a book truck, added a laptop and barcode scanner and printed up some colorful signs. I made sure to announce the event at the middle school morning assembly, emailed the faculty to encourage them to remind the kids, and notified the communications department of the photo op for the newsletter. I set myself up in a corner of the dining commons, arranged the books attractively and before I could even sit down, I had customers – happy, smiling, ready-to-read customers. I circulated more books that afternoon than I had in the entire previous week and there was a ripple effect that lasted for several days, since some students asked about this or that book I had not brought, but could check out and deliver at lunch the next day or to a classroom. 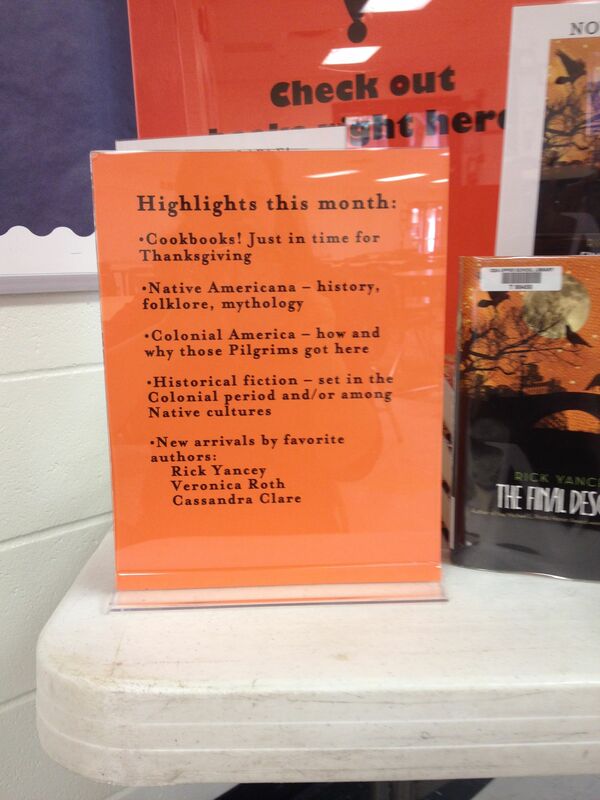 It was so successful I repeated it earlier this month with new titles plus Thanksgiving-related books like Witch of Blackbird Pond, some Ann Rinaldi titles and books about Native American lore and history. The kids tell me they are eager to have it every three weeks or so. To prepare, I have invested in a tabletop poster holder, some book-printed fabric for a tablecloth, sign holders and colorful paper to help merchandise the books enticingly. Feel free to get in touch with specific questions if you’d like to try launching your own Pop-Up Library – it’s easy, fun, and effective.